If archaeologists wanted to excavate Chicago to discover its history, they would quickly realize digging down is far less productive than just opening your eyes and looking at the panorama of a city block. The sediment of Chicago reaches left and right, not down, and it’s by noticing one building next to another that Chicago’s turbulent history jumps out at us. The city is a jumble of homes, storefronts and skyscrapers that bring us back to before the Great Chicago Fire, back to the golden age of railroads, back to the time when internationally acclaimed architects fled Europe for the safety and capitalist progressivism of the Second City. For archaeologists in Pompeii, the volcano was a gold mine, freezing the city in time. But imagine a different kind of destructive force, with the accuracy of a pencil eraser, deleting just one moment of a city’s past at a time. A bulldozer, tearing down what we believe future generations won’t miss—the now-ubiquitous square glass boxes of Mies van der Rohe’s protégés, the harsh concrete of Brutalism, the strange contraptions of architects excited by new materials that became ordinary almost instantaneously. This isn’t a new eraser; its sights are just set on a new comma in the paragraph of our city’s history. In the 1960s, the powers that be in a city swept off its feet by a thriving economy and home to leading architects of the era, planned to tear down turn-of-the-century buildings by now-untouchable greats like Louis Sullivan and Frank Lloyd Wright. The concept of preservation was born in reaction to this force, and it wasn’t the work of old fuddy-duddies who waxed nostalgic about how much better architecture was back in their day. Rather, the generation that grew up surrounded by Sullivan and Wright buildings saw them as an inextricable part of the fabric of their city and recognized their value. For decades since, generations of preservationists have advocated for these prewar buildings, but they weren’t particularly interested in the buildings they remembered going up in their lifetime—just like the generation before them. Recently, a new generation of activists realized if they didn’t act quickly, those mid-century modern buildings would start disappearing exponentially. 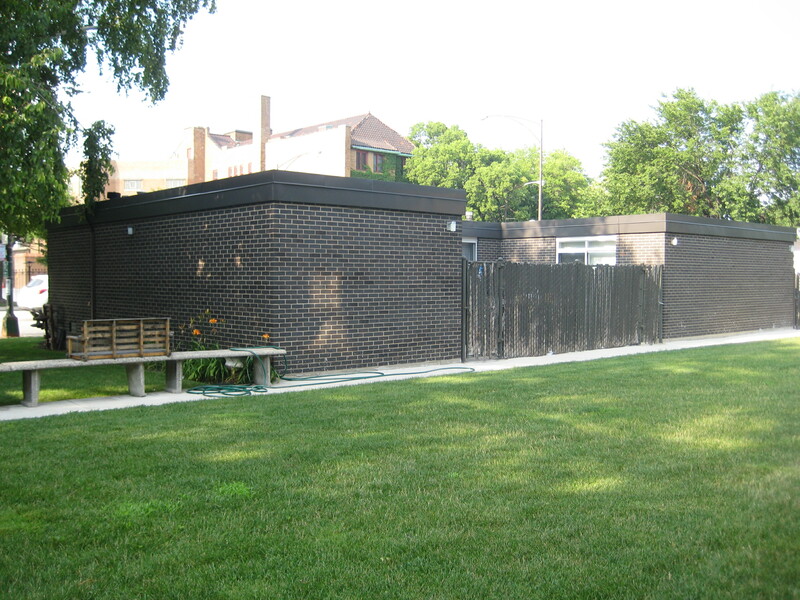 Of the 276 individual landmarks listed on the Chicago Landmarks web site, just seven are buildings built after 1945. While this includes three buildings by Mies van der Rohe and the Inland Steel Building by Skidmore, Owings & Merrill, not all the mid-century landmarked buildings have modern influences. The most recently built building to receive landmark status is Mies’ IBM building, completed in 1972. While most significant postwar buildings aren’t currently being considered for demolition, it’s likely that more and more property owners will be making decisions about these structures in the next ten to fifteen years. Because an important architect designed the building and plans are still up in the air, Prentice may have a fighting chance. “It’s a wonderful building and the argument [to tear it down] is not a strong argument,” says Joseph Rosa, who recently left his position as the Art Institute’s chief curator of architecture and design for the University of Michigan, where he is now the director of the university’s Museum of Art. Preservation Chicago, a nonprofit organization that advocates for the conservation of historic architecture in Chicago, hopes Prentice will remind Chicagoans and city decision-makers that modern buildings, as well as older ones, are worth saving. “When buildings hit the twenty-five, thirty, thirty-five, forty age range, they become too young to be old and too old to be young. They’re at a very critical point in their history,” says Jonathan Fine, the organization’s director. “In other words, they’re too young to be appreciated as valid and important pieces of architecture.” The owners of these buildings are left with the expensive and unpopular option of renovating or preserving these deteriorating, outdated buildings, or just tearing them down and starting afresh (also expensive, but at least you get some shiny new bang for your buck). Various preservationists I spoke with said they wondered what would happen to sites like Naess & Murphy’s One Prudential Plaza and Walter Netsch’s University of Illinois-Chicago campus in the future—while not currently threatened, they questioned whether people saw them as architectural works worth holding onto. Spicer begins drawing the floor plan of these low-income homes on a piece of paper. It looks like the crenellated crown of a castle. “The outside of these buildings doesn’t tell us what’s going on inside,” he says, explaining how the Mies-taught architect Y.C. Wong built these buildings on a miniscule budget during the mass exodus of white people to the suburbs in the 1960s. On the other side of these fortressed entryways, says Spicer, are large south-facing windows that enclose a garden. These homes, he says, are beloved by the people who live in them for their efficient use of space and the safety of a backyard instead of an exposed front yard. It took him thirty-three years to realize their elegance. “It’s a really clever, in some ways beautiful building, but it took me a while to figure it out,” he says. Preservationists see Prentice as an opportunity for mid-century modern redemption. They’re struggling to come back after a defeat over Michael Reese Hospital, which was demolished last year in order to create a site that could be used for the 2016 Olympics, if they came to Chicago. Bauhaus School founder Walter Gropius designed the master plan for the hospital in the mid-forties, but it was not until plans for demolition were already on the table and preservationists had started their campaign to save the buildings that the director of the Gropius in Chicago Coalition, Grahm Balkany, discovered Gropius was in fact closely involved with the design of eight of the twenty-nine buildings. It was too late—demolition was confirmed before the Olympic decision was announced, and the city had no backup plan for the site without the Olympics. Preservationists were devastated, convinced that if the public had known about Gropius’ involvement earlier in the process, the buildings would have been saved. It’s an argument that comes up again and again in preservation. Preservationists tend to support the preservation of buildings they’ll concede aren’t great works of art. They argue that the historical value of the building as part of an architect’s portfolio, or the importance of holding onto early examples of experimental techniques that may have been better developed later on, is reason enough to landmark a building. Architects don’t always share this perspective and, in the case of modernism, it’s one that runs counter to ideologies of modern architecture, which places value on new technology and progress. On the other hand, some buildings, like Prentice, are significant enough that most preservationists and architects are passionate about holding onto them. While preservationists and architects mostly agree Prentice is architecturally valuable, others familiar with Prentice and Goldberg’s architecture aren’t necessarily interested in saving it. The building’s unusual curvilinear shapes stand out in a city of rectilinear buildings, and people are divided on whether or not that’s a good thing. “Most people on the street, or even art historians who don’t know where he was coming from, look at it and immediately classify him as whimsy or kitsch,” says Balkany. That, he says, “would really make Goldberg roll over in his grave.” Goldberg’s buildings, says Balkany, follow the modernist dictum that the form of a building be derived from its structural requirements. Goldberg made the leap of applying shell structure to high rises, which Balkany says was “socially, formalistically, stylistically and economically” innovative. Rosa says Goldberg is ripe for rediscovery, and an exhibit at the Art Institute on Goldberg planned for 2011, paired with a publication by Yale, will likely renew interest in him. “Unfortunately,” he says, “It won’t be happening early enough to probably save that building… Things are rediscovered, but sometimes it takes longer bureaucratically,” he says. Rosa says the analytical complexity of Prentice, which is bilaterally symmetrical, is both beautiful and practical. Goldberg placed the nurses’ station in the hub of the building, with spokes branching off into the patients’ rooms so nurses could easily reach the room they wished to visit without having to dash down multiple hallways. “Not everything needs to be saved. Goldberg, on the other hand—his hospitals are his jewels, and they should be saved,” Rosa says. Preservationists are optimistic Prentice will fare better than Michael Reese. Alderman Brendan Reilly of the 42nd Ward says he has yet to take a stance on the issue but plans to have extensive dialogue with Northwestern, preservationists and his constituents before making a decision. “I think it’s a bit premature to talk about landmarking the building,” says Reilly, who wants to hear Northwestern’s proposal for the site first. Reilly is already in the process of trying to landmark Goldberg’s Marina City, the iconic pair of corncob-shaped apartment high rises along the river. Preservationists also have to gain the support of neighborhood residents, politicians and local leaders in architecture in order to make a strong argument against the building’s demolition. 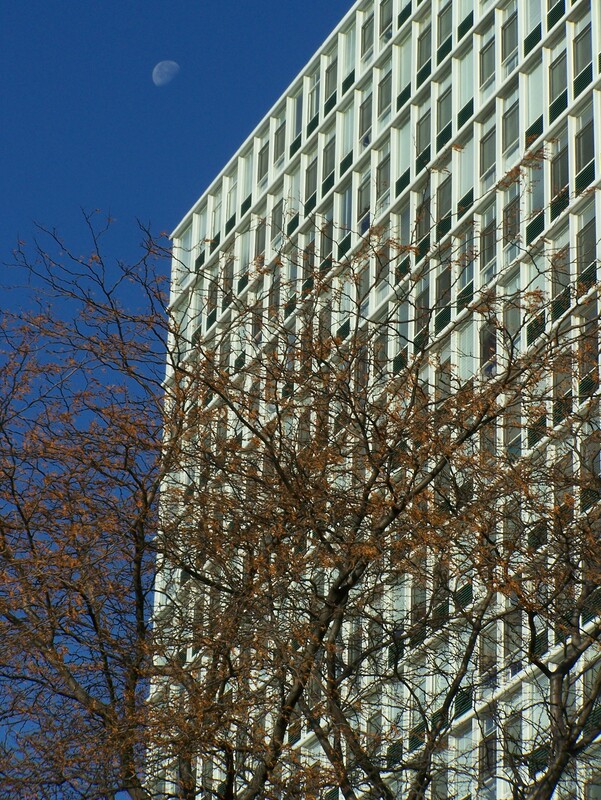 Unlike Marina City, which thousands and thousands of people see out of car, El, apartment and office windows on a daily basis, Prentice is comparatively unknown to Chicagoans, nestled within the Northwestern hospital campus. People who have come to understand and appreciate Marina City may not feel the same way about Prentice. 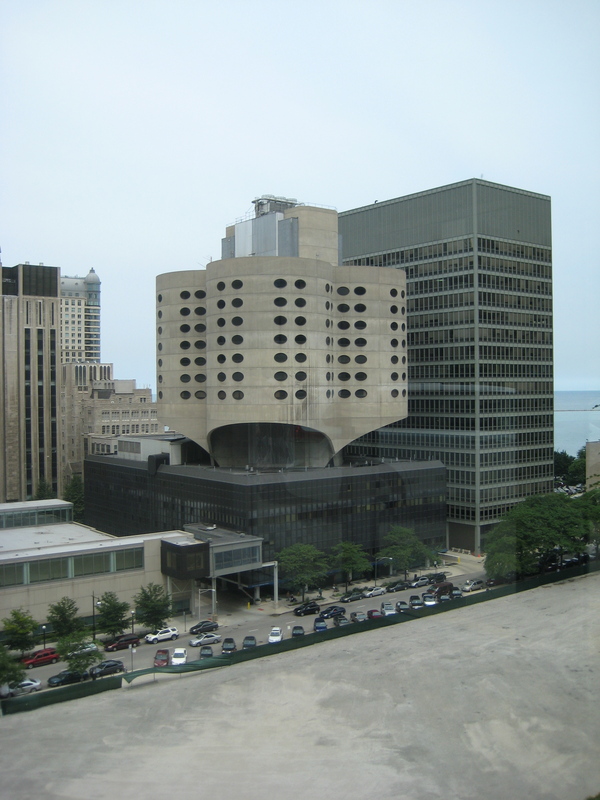 Like Michael Reese, Prentice is also a challenge because it’s a hospital. Hospitals are built to fit the specific needs of a medical facility, and despite their short lifespan, reuse proposals for hospitals are limited. Fine says there are a number of options available to Northwestern, thanks to the building’s prime location in downtown Chicago. He says Preservation Chicago may recommend the hospital be transformed into studio apartments or dorms, which would be attractive to Northwestern students and employees. He says the remodel would be relatively straightforward, since the patient rooms are the size of a small studio apartment and already have their own bathrooms. Another possible reuse would be to convert the rooms into administrative offices for the hospital. It’s a more traditional proposal, and one that was approved by the city for the huge Cook County Hospital building. But Cook County Hospital is a neoclassical building completed in 1916, and increased public support for modern buildings hasn’t translated into a very successful landmarking campaign in Chicago. What came into high relief for preservationists as they watched demolition begin on the Michael Reese hospital even before it was scheduled to start was just how hard‚ some might say impossible—it was to stop the machinations of Chicago politics. “Preservation in Chicago is a different animal,” says Balkany. “There are all these political shenanigans that go along with it.” Landmarking, he says, “has really degenerated into a tax freebie for your friends.” Balkany says it’s extraordinarily rare for a building to be landmarked solely for its historical architectural value. “If the person or property in question benefits from it, then they do it,” he says. Balkany says this force exerts itself within the preservationist community as well—if a preservationist has a connection with somebody who stands to benefit, or lose, from landmarking a particular building, they may direct advocacy toward or away from that site. But Rosa says despite its political challenges, Chicago is a leading city for preservation. “If anyone can get through the city politics, it’s the noted city people of Chicago. They can make a difference, they can be heard,” he says. The problem, he says, is that “it’s been an uphill battle for that period of architecture,” especially for buildings that aren’t single-family homes. The challenge is exacerbated by a landmarking ordinance that excludes buildings built after 1940: the Chicago Historic Resources Survey identified more than 17,000 buildings with historic or architectural importance, and buildings with significant importance are required to give a ninety-day notification prior to demolition. Buildings built after then that aren’t landmarked can be demolished without notification. Prentice Hospital is just one project preservationists have chosen to focus in on among dozens of possibilities. Balkany, who’s made it his personal mission to make sure these buildings don’t get forgotten, is an archaeologist of the recent past. He’s an encyclopedia of modern architecture in Chicago and his discovery of the extent of Gropius’ involvement with Michael Reese isn’t a coincidence. Balkany knows modern Chicago inside and out, and researches to find out what he doesn’t know, or he did. He says he’s gotten dispirited by how many buildings have been torn down despite his efforts, and he isn’t as involved as he used to be. It’s clear he still knows more than almost any other preservationist I met, though. When preservationists don’t know the answer to a question, they say, ask Grahm, he’ll know. Buildings on Balkany’s salvation short-list right now include two high-rise apartment complexes, Prairie Shores Apartments and Lake Meadows. Prairie Shores Apartments, on South King Drive by the lake, was designed by Walter Gropius, Sasaki+Novak, and Loebl Schlossman & Bennett (the same group of architects that worked on the Michael Reese Hospital complex). According to Balkany, there are rumors that the building will be “reskinned.” The five high-rises in the complex have curtain walls, meaning the walls of the building aren’t structural and replacing them could completely transform the building. The Lake Meadows complex on East 33rd Street by the lake, designed by Skidmore Owings and Merrill, is slated for demolition. Renters of the nine high-rises would be forced to move, making way for a new development. “The claim is, you’ll all get to be relocated into the new stuff, and that’s exactly what they said in the 1960s when they cleared everybody out for the projects,” Balkany says, adding that residents feel there’s little they can do to prevent the demolition of the building. “I went to the community hearings… and the residents are furious,” but he says the alderman supports the new development. Balkany says he spoke about Lake Meadows in New York City to preservationists. “I showed them some pictures of Lake Meadows and people were actually dumbstruck [they were going to be torn down]. It’s possible because of the political scene, and it’s possible because the people who live on the South Side of Chicago feel powerless,” he says. Balkany, like all the preservationists I spoke with, says he doesn’t want to save every building. He just wants people to evaluate whether the advantages of tearing down an old building outweigh the benefits of holding onto it.